Brooks & Dunn received an unprecedented 10 wins as the Country Music Association's vocal duo of the year. This year, they could win their 11th award. The two are nominated for Vocal Duo of the Year, Entertainer of the Year, Music Video of the Year and Song of the Year, from their "Red Dirt Road" CD. 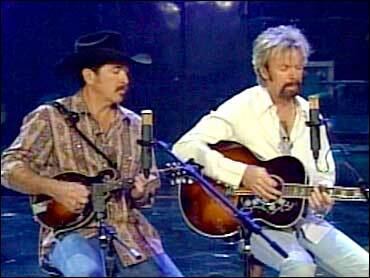 Kix Brooks and Ronnie Dunn performed "Red Dirt Road" for The Early Show. After having wild stage shows, with a cannon spewing confetti and blowup dolls, the duo says, it is returning to its roots. Dunn tells co-anchor Hannah Storm, "It is kind of organic. We went back and looked at how we grew up and we just wrote songs about these little places we would hide away as we were growing up in rural America." The song is about rites of passage for both artists. Dunn explains, "I was torn between becoming a minister or a country singer and thank goodness the country singer won out at some point." For Brooks, it was military school. But at some point, Dunn says, they came together. When they first moved to Nashville, they moved in with Johnny Cash and June Carter, becoming very close to them. About Cash, Dunn says, "He'll be on everybody's minds tonight. He'll be as prevalent as many of the awards and more so than what's going on. He was a huge icon for not just country music, but music in general. We miss him a lot." Brooks says he was quite an inspiration for them. Dunn adds, "John was a rock star as well as anything else and that rebellious edge that he brought to the table is the thing that we all - we all want to be bad boys. June used to tell me, 'Ronnie, any time Kris Kristofferson or Willie or John get in trouble their record sales would go up. It can't be bad." According to the duo's Web site, Brooks & Dunn sold 22 million albums, scored 18 No. 1 hits and heard their names called as Entertainer of the Year three times. Asked what the secret to their success is, Dunn says, tongue-in-cheek, for him, it is the hair, "Kix is the hat, and that's it."